Selling a house is a major decision that demands careful consideration. After all, securing more money from selling your home gives you more capital to invest with your financial advisor. Your location, for one, plays a major factor. Houses in some places will sell immediately, while others stay on the market for months. Home values in your area may also mean that it’s easier or more difficult to sell your home for a profit. We considered those factors and more to create this list of the best cities to sell a house. To rank America’s best cities to sell a house, we examined data on five factors. We looked specifically at the five-year change in home values, how long the average house spent on the market, the percentage of homes sold for a loss, closing costs and the number of real estate offices per 1,000 residents. You can learn more about our data sources and how we created the final rankings in the Data and Methodology section below. Arizona and California are great for selling a home. Both states have four cities in our top 10. The Arizona cities tend to do relatively well across all metrics, while the four California cities all have top-15 rates for the change in average home values. These states also dominate the top 25. Arizona has seven of the top 25 cities, and California has 14. Nevada and Colorado round out the top 25. All the cities in our top 25 are from one of four states: Arizona, California, Colorado and Nevada. Colorado cities have appeared in our rankings before, but this is Nevada’s first time with a city in the top 25 (North Las Vegas). Nevada also has six total cities ranking in the top 50. East Coast cities don’t score well. The easternmost city in our top 50 is in Texas. The first city from a state along the East Coast is St. Petersburg, Florida, at 62. Virginia in particular scores poorly. Four of the bottom 10 cities in our rankings are in Old Dominion. Notably, those four cities all saw decreases in average home value between 2013 and 2017. 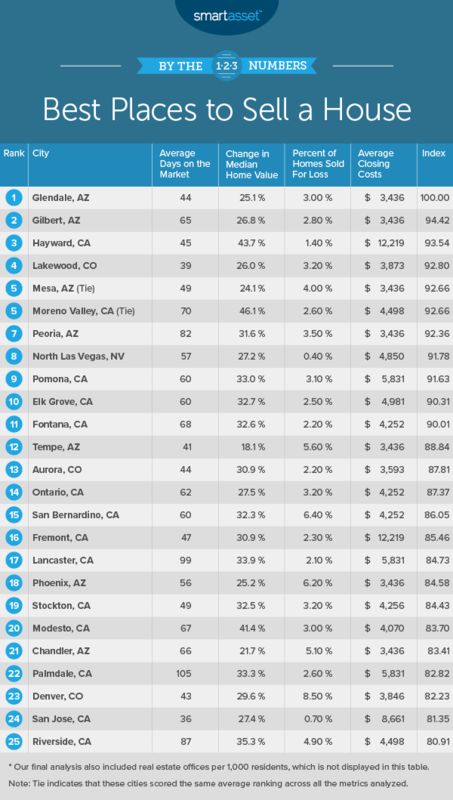 Arizona cities perform well in our rankings, and it all starts in Glendale. From 2013 to 2017, home values in this Phoenix suburb increased by approximately 25%. Demand for those houses still seemed high, however. Houses stayed on the market for an average of just 44 days. That’s the 20th-lowest number of days of all 165 cities in the study. Only 3% of Glendale’s homes sold for a loss, and this is also a top-25 rate. Another factor helping Glendale land the top spot is its high density of real estate offices. Its 23 offices per 1,000 residents is 15th highest in this study. Much like Glendale, Gilbert has a high density of real estate offices, a boon for hopeful sellers. It has 24 offices per 1,000 residents, which is the 14th-highest rate in our study. Home values have risen by almost 27% and fewer than 3% of homes sold for a loss. In addition, because we recently found that Gilbert is also the best city to buy a home big enough to raise a family, sellers know they have a particular lure for certain homebuyers. One factor that keeps Gilbert from ranking first is the average time that houses spend on the market: Houses here are on the market for an average of about 64 days. After ranking fifth last year, Hayward remains a great place to sell a house. The biggest reason Hayward does well is the high increase in home values. The median home value rose from $321,500 in 2013 to a whopping $462,000 in 2017. That’s a change of 43.70%. Only one city in the study saw a higher percent increase. Even though closing costs here are among the 10 highest in our study, Hayward had the seventh-lowest percent of homes sold for a loss, at 1.40%. Houses also sold quickly, spending an average of slightly more than 45 days on the market. The only city to represent Colorado in our top 10, Lakewood is a great place to sell a home. Home values here have increased 26% between 2013 and 2017, and only 3.20% of houses sold for a loss. Especially notable is that homes spend an average of just 38.60 days on the market. That’s the 11th-lowest rate we found. Mesa is not only the third Arizona city in our rankings, but it’s also the third in the Phoenix metro area. Unlike other cities in the top 10, there isn’t a specific metric for which Mesa stands out. It simply does well across the board. For every factor we considered, Mesa ranks in the top 30% of cities. Home values increased slightly more than 24% from 2013 to 2017. Homes spent fewer than 49 days on the market, on average. Only 4% of homes sold for a loss. If you’re looking for help selling a house, you should be able to find it. There are about 12 real estate offices per 1,000 residents. But before you sell your home in Mesa, consider that it’s also one of the best cities for an early retirement. 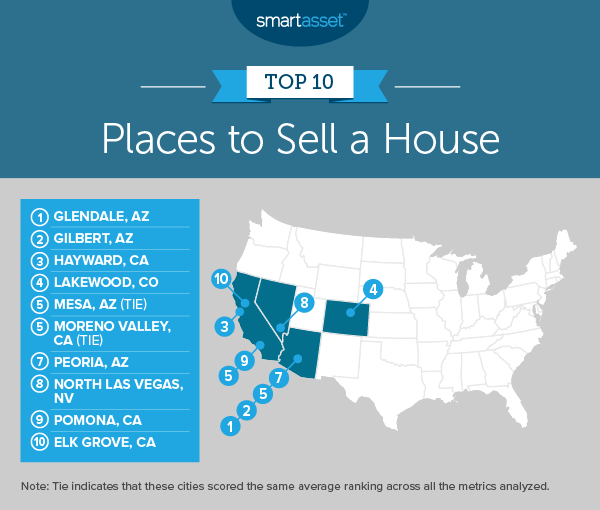 Tied for fifth is last year’s number two city to sell a house, Moreno Valley. Home values here increased more than in any other city that we considered. The median home value rose from $178,400 in 2013 to $260,600 in 2017. That’s a 46.10% uptick. And just 2.60% of those homes sold at a loss, which makes that the study’s 18th-lowest rate. One factor keeping Moreno Valley from ranking higher is that closing costs average about $4,500. The Phoenix suburb of Peoria saw a 31.60% increase in home values, which makes it 18th highest out of the 165 cities we looked at. The city also ranked seventh for density of real estate offices: There are nearly 35 per 1,000 residents. At 3.50%, the number of homes sold for a loss is also relatively low. That ranks in the top 20% of cities. If you’re curious about who might buy your home, you may be interested to hear that Peoria has become one of the most popular cities for millennials to buy homes. If you’re living in North Las Vegas, now may be a good time to sell. The median home value has risen 27.20% from 2013 to 2017. With median income only rising about 10% in that time, North Las Vegas has also become a place where residents may be getting priced out of affordable homes. The major factor behind North Las Vegas’ top-10 finish is that it has the lowest percentage of homes sold for a loss, at just 0.4%. The city also ranks in the top 30% of the study for its density of real estate offices and for the number of days houses spend on the market. The average house spends about 57 days on the market. Pomona, in Los Angeles County, has the highest density of real estate offices in the study, with more than 92 offices per 1,000 residents. That’s not Pomona’s only claim to fame, though. The median home value also increased by 33% from 2013 to 2017. That’s the study’s 12th-highest rate. Houses also seem to move quickly: The average house spends just 60 days on the market. Ranking in the top 10 for the second straight year is Elk Grove. This city saw a rise of 32.7% in median home values from 2013 to 2017. That’s the 13th-largest increase in this study. Elk Grove also had the 16th-lowest number of houses sold for a loss (2.50%). While not the highest amount, its density of real estate offices ranks in the top 25% of cities. Like some other cities in this top 10, Elk Grove is also a popular city for millennial homebuyers. Five-year change in median home value. This is the percentage change in median home values from 2013 to 2017. Data comes from the Census Bureau’s 2013 and 2017 5-year American Community Surveys. Average number of days on the market. This is the average number of days a home is on the market before it is sold. Data comes from SmartAsset’s 2019 study on the healthiest housing markets. Percentage of homes sold for a loss. This is the percentage of homes sold for a price lower than the previous sale price. Data comes from SmartAsset’s 2019 study on the healthiest housing markets. Closing costs. This represents average closing costs by city. Data comes from SmartAsset’s 2018 study on places with the lowest closing costs. Real estate offices per 1,000 residents. This is the number of real estate offices per 1,000 residents. Data comes from the Census Bureau’s 2016 County Business Patterns Survey. To create the final scores, we ranked all of the cities in each metric. Next, we found each city’s average ranking and gave a double weight to five-year change in median home value. Using this average ranking, we created our final score. The city with the best average ranking received a score of 100 and the city with the worst average ranking received a 0. Spruce up your home. Even something as simple as applying a fresh coat of paint can help make your home more appealing to a buyer. Remember that the exterior of your house is the first thing a potential buyer will see. Neglecting the house’s exterior and yard is a common reason for a house not to sell quickly. Don’t ignore the interior either. Clean up and get rid of things if necessary. Consider a yard sale. A little sprucing up can go a long way. Make sure you have emergency savings. In the tumult of selling a house and potentially moving, unexpected costs often come up. If you have some money set aside already, you can protect yourself. A good place to stash these rainy day funds is a high-yield savings account. These accounts have interest rates of 2% or more, and make your money work for you. The average interest rate from a traditional savings account is about 0.10%. At that rate, you could lose money because of inflation. Talk with an expert. Regardless of why you’re selling your home, it’s nice to talk with an expert to help you decide whether now is the right time to sell. For example, it may make more sense for your financial health if you wait a bit longer. An expert like a financial advisor can also help you understand how much you need to sell a house for a sale to make sense. To talk with an expert, try our free financial advisor matching tool.